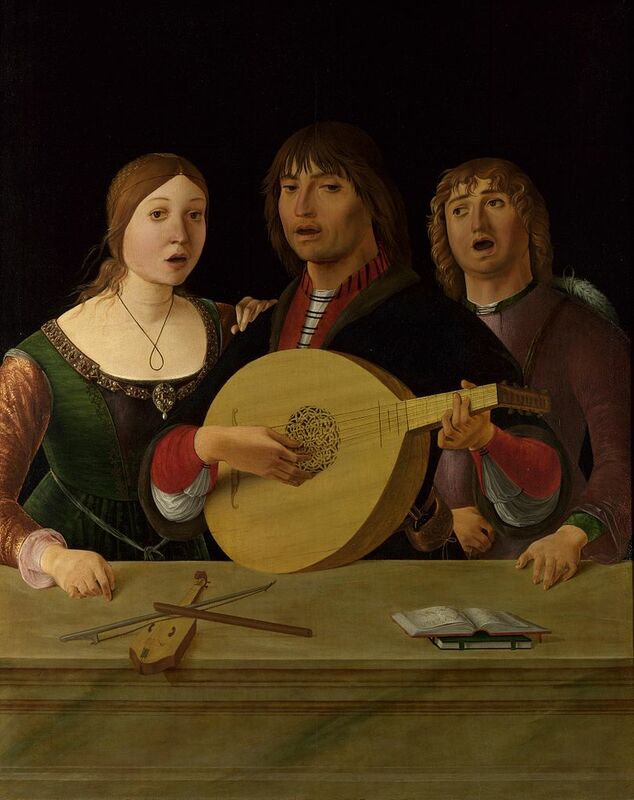 The practice of singing to the lute had a long tradition in Italy by the end of the 15th century. Although the earliest manuscript for lute to survive is dated to the 1490s, from the time of Petrarch (1304-1374) the new humanists of the Italian renaissance had established the lute as a central component of their artistic, musical, and literary activities. The melodies to Petrarch’s canzonas were not preserved, but we have the texts of his songs, many of which were set to music by the frottolists a century later. By the late 15th century, the Medicis had long established Florence as a center of culture in Italy, and their political and cultural influence radiated to other courts throughout the peninsula. It was at Mantua – about 125 miles north of Florence and closer to Venice – that the frottola developed into an artistic movement, at the court of Francesco II Gonzaga, Marquess of Mantua, under the patronage of his wife the Marquesa of Mantua: Isabella d’Este. 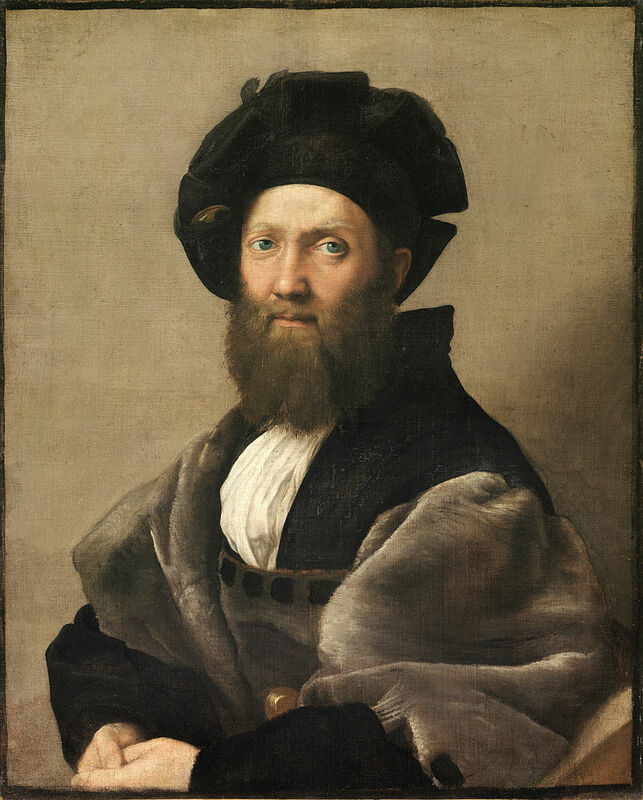 portrait of Baldassarre Castiglione, Count of Casatico (1478-1529) by Raphael, 1514/1515. One of many prominent renaissance artists and men of letters patronized by Isabella d’Este, today Castiglione is most famous for ‘The Book of the Courtier’ (1528). The book was published in over a hundred editions over the next century in Spanish, German, French, Polish, and English as well as the original Italian. ‘The Book of the Courtier’ describes the ideal characteristics for a renaissance prince and his court – it was tremendously influential and served as a primer of court etiquette and education for generations. One of the many qualities extolled by ‘The Book of the Courtier’ is an education in music. Isabella was a gifted linguist, and a talented singer and musician – she learned to play the lute from the celebrated lutenist and teacher Giovanni Angelo Testagrossa (1470 – 1530) who was once thought to have been Francesco da Milano‘s teacher as well (this notion has been discredited). 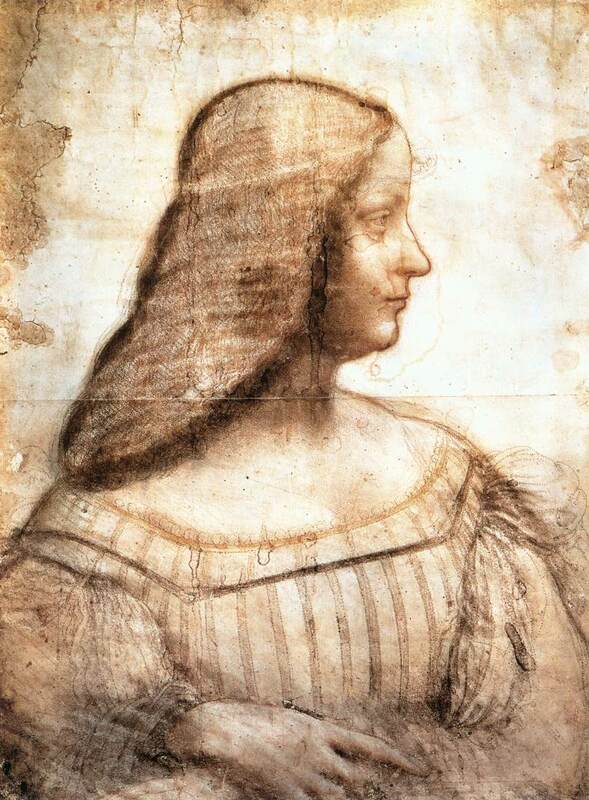 She surrounded herself with celebrated artists, poets, and men of letters including Leonardo da Vinci, Ludovico Ariosto (Orlando Furioso), Baldassare Castiglione (The Book of the Courtier). Each of these verse forms bears a distinct meter and rhyme scheme. In addition to settings of Italian poetry, the frottolists set Latin verse to music as well – Virgil was especially popular at the Mantuan court (he was the city’s favorite son). Between 1504 and 1509 Petrucci published nine volumes of frottole in four parts. These prominently feature songs by the two leading composers in the genre, Bartolomeo Tromboncino (c.1470 – c.1535) and Marchetto Cara (c.1470 – ?1525). Bartolomeo Tromboncino was born in Verona, about 30 miles north of Mantua, where he grew up – his father was also a musician, and may have been employed by the Gonzagas. By 1494 Tromboncino was also active as a musician at the court in Mantua, and he may have been the leading musician in Isabella’s circle at the turn of the 16th century. He was the most prolific writer of frottole – 176 are attributed to him (15 of these are also ascribed to others). Tromboncino was a volatile and violent man – he killed his wife and her lover upon finding them in flagrante delicto in 1499. He seems to have been pardoned for the murders as he continued to work in Mantua until 1501, when he left after more (unspecified) scandalous behavior. He exact whereabouts after this are uncertain for many years, but it is thought that he spent some time at the court of Lucrezia Borgia in Ferrara before eventually settling in Venice by about 1520. …the singing of our own Marchetto Cara is just as moving, but its harmonies are softer; his voice is so serene and so full of plaintive sweetness that he gently touches and penetrates our souls, and they respond with great delight and emotion. More than 100 frottole are attributed to Cara. 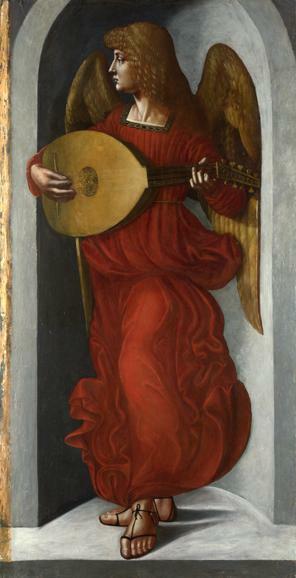 If Tromboncino’s frottole are characterized by a greater sense of gravity and seriousness in his settings, Cara typified the ideals of his time, honoring the tradition of singing amorous verses to the lute from the 15th century while looking to the future of the Italian secular song. Frottole in general are light and restrained in mood and do not musically describe or express the text – typically they are in strophic form (several verses set to the same repeating music). Towards the end of his career, Cara composed some of the earliest, true through-composed madrigali. Che debo far (Trombocino) from Bossinensis’ Libro Primo (1509). Aldo Bova, recorder; Trond Bengtston, lute. In this example of an instrumental performance of a frottola, Aldo Bova elaborates the soprano part with divisions the second time through. Petrucci’s nine volumes feature frottole in mostly 4 parts, although there are also some á 3, and á 5. Although it is clear that there was a widespread practice of singing these songs to the lute, it was not the only practice, and they might be sung in any of a variety of combinations depending on what singers and instrumentalists were available. This practice of alternate possibilities of performance for different instrumentation was in fact the general practice for musicians during the renaissance – well into the 17th centuries, and even later. It was only towards the end of the baroque period when composers began to write for specific instrumental timbres that this practice became less common. 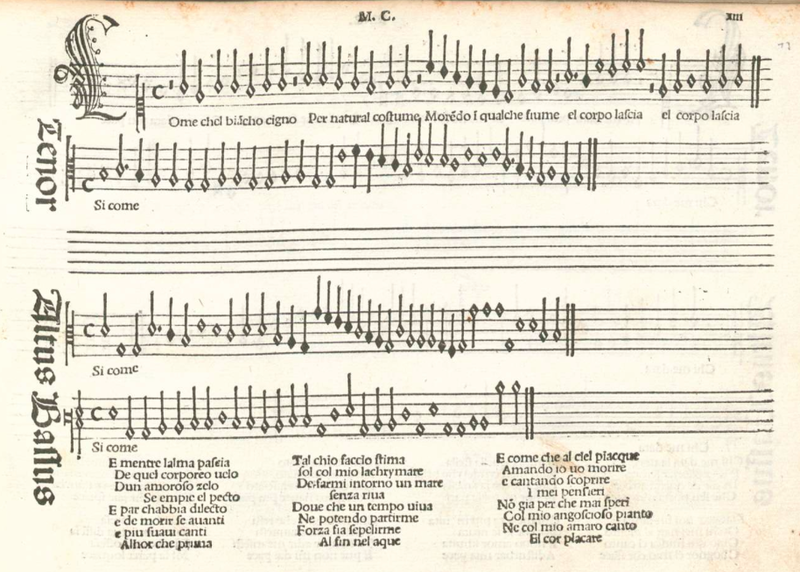 In 1509 Petrucci issued a collection of frottole arranged for voice and lute, accompanied by ricercare for solo lute, by Franciscus Bossinensis. Unfortunately, practically nothing is known about him, beyond the assumption that he came to Venice from Bosnia. Tenore e contrabassi intabulati col sopran in canto figurato per cantar e sonar col lauto Libro Primo was the first book of its kind: a collection of lute songs, each featuring the soprano part in mensural notation with text and an intabulation of the tenor and bass parts – all on the same page. This was an impressive and unprecedented feat! As “Libro Primo” was part of the title, it is clear that it was intended to be followed by the second volume, which however had to wait until 1511 to be issued, after Petrucci had returned to Fossombrone earlier that year. The 46 ricerare for solo lute included in the Bossinensis prints, although appended to the end of each book, are related to specific frottole by a lettering system and are intended as brief introductions to the songs. Io non compro più speranze (Cara) from Bossinensis’ Libro Primo (1509). Marco Beasley, tenor; Fabio Accurso, lute. Bossinensis eliminated the alto parts for his arrangements. Although Petrucci’s first editions of frottole feature a cappella settings of the songs in primarily four parts, some scholars believe that frottole for the most part were originally conceived for and performed by a single singer (often the composer himself) accompanied on the lute as demonstrated in the Bossinensis prints, and that the a cappella arrangements (although printed first) were actually made later. In this case the alto parts may have been added to the a cappella arrangements instead of subtracted from the lute song settings. Due to the relative simplicity of the lute parts, Petrucci may also have sought to reach an amateur market with the Bossinensis volumes – these versions of the songs may have reduced the complexity and technical difficulty of the lute part to bring them within reach of the abilities of Venetians who were not professional musicians, but simply wished to sing and play frottole at home for pleasure. Ottaviano Petrucci left Venice in April 1511 and returned to Fossombrome. He continued to produce books of music – more frottole, masses, and motets, but never again at the spectacular rate he brought forth his first editions in Venice. In 1513 he received a fifteen year monopoly to print music in mensural notation and organ tablature from Pope Leo X. With this permission he was able to continue to issue volumes in his series of sacred music prints, but he did not produce any volumes of organ music and this permission was revoked. In 1520 he produced his last musical print – a collection of polyphonic settings of Petrarch by Bernardo Pisano (1490 – 1548), who was composer and organist for Cosimo I de’ Medici. This book was the first published to exclusively feature the music of a single composer. Although the word madrigal was not yet in use to describe the new style set forth by Pisano in Musica di messer Bernardo Pisano sopra le canzone del Petrarcha, many today acknowledge him as the first madrigalist. It is altogether fitting that Petrucci closed his unprecedented career as a printer ushering in the new style that would dominate secular vocal music in Europe for the remainder of the renaissance. In 1536 he was commanded by the senate of Venice to return to their city, and he spent the last three years of his life there assisting in the production of classical texts in Latin and Italian. By walterbitner in Early Music, Music, Renaissance, The Lute on November 25, 2016 .